Japanese college student on the street in Harajuku wearing an off-the-shoulder top over a lace top, a tulle skirt, knee socks, and platform high top sneakers. Harajuku girl wearing cute pastel fashion including a keisuke kanda striped blazer with a tulle skirt, scarf, beanie, lace socks, and platforms. Harajuku girl in red kimono jacket with Yubi Ga Ippon top, Comme Des Garcons pants, and YRU platform shoes. 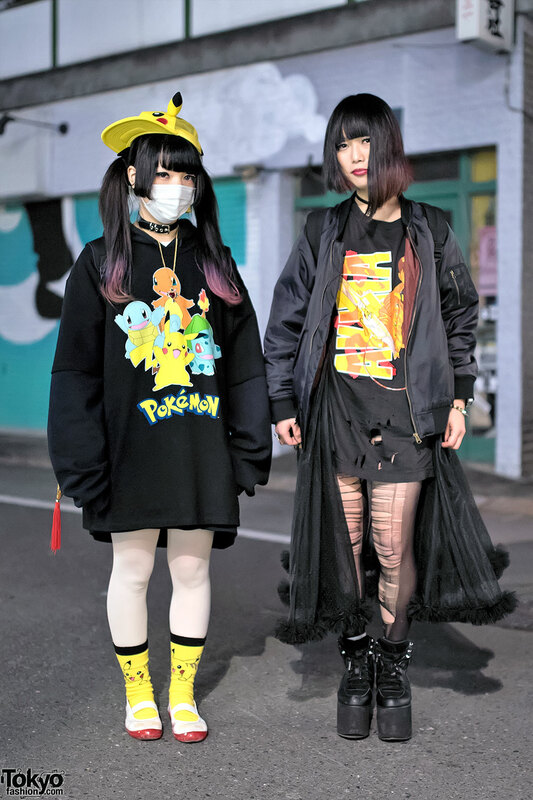 Harajuku girl with dip dye twinails wearing lots of Pikachu fashion vs friend in bob hairstyle and Akira fashion on Cat Street. Harajuku girl with a yellow bob hairstyle, a Guns N’ Roses t-shirt, a Jeremy Scott x Swatch watch, and YRU platform shoes. Harajuku girl in mini skirt, pastel top and coat, faux fur cowl, heeled maryjanes and a cute backpack. Yellow hair & blue lipstick with diamond print dress, denim jacket, torn tights, metallic clutch and platform sneakers on the street in Harajuku. 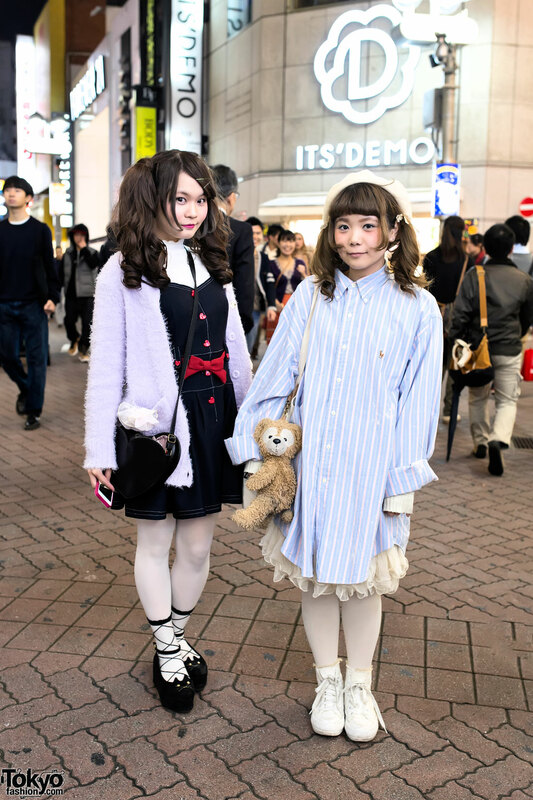 Two girls with cute twintails hairstyles and fashion from Milk and Syrup on Center Street in Shibuya. Lilac twin buns with headscarf, baroque print t-shirt, mini skirt and suspender stockings. Graphic t-shirt, faux leather shorts, and colorful jacket worn with studded sneakers, round sunglasses , and chain necklace.